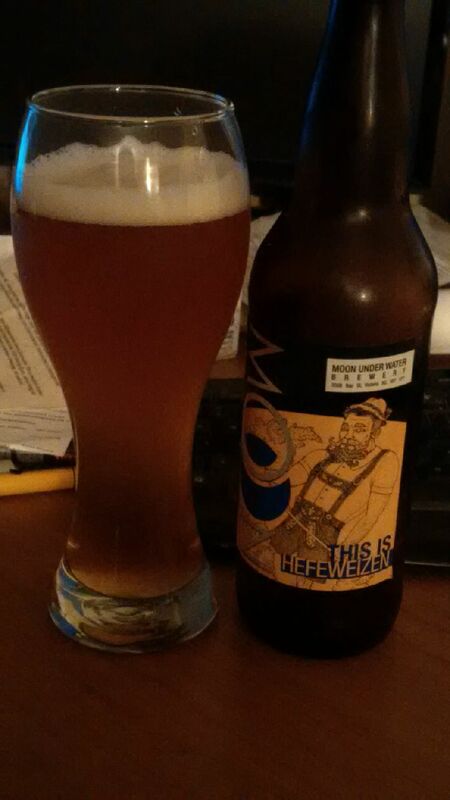 From Victoria BC’s The Moon Under Water Pub & Brewery comes their “This Is Hefeweizen”. The beer pours a cloudy golden colour with a white head. The aroma consists of wheat, banana, fruits, spices and yeast. The flavour is of wheat, citrus, banana, spices and yeast. The alcohol content comes in at 5.5%. Hefeweizen beer as great summer sippers and this one is right up there with the best in BC. Commercial Description: Unlike every other beer we have brewed, this one follows some style guidelines. Why? Because in a land where big breweries produce bland, boring blonde ales and pass them off as Hefeweizens, something traditional needed to be done. Brewed with 70% weizen, decoction mashed, and open-fermented with hefe from Bavaria. This is Hefeweizen. This entry was posted in hefeweizen and tagged banana, bananas, bc, beer, brewery, canada, citrus, hefeweizen, moon under water, moon under water pub, spice, spices, victoria, wheat, yeast. I talked to a few people when I was at the Spinnakers 30th Anniversary party And it was split 50/50 about the carbonation. It is good isn’t it? And yes, if the carbonation was off, then it definitely had to be a bad batch. I’ve had a few bottles of this now and they were always spot on with the head.